We had our Annual Ladies to Dine evening at Hope Street, which this year was extra special as we had fantastic support from our Mother Lodge Neptune No 1264. The evening was superb with a lot of money being raised for charity, and all present having a great time, we had Live music and a 5 course meal, as always it was a delight for us to support our much cherished guests gratis, the widows of our dearly departed brethren. With Roses and Chocolates for the Ladies and a massive thanks to W.Bro. Ted Bickley and his wife Vera for their hard work in his year as Master of the Lodge, the evening was a massive success and enjoyed by all. It is sad to report the death of one of Minerva Lodge’s former members, Brother Ronald Smith Lancaster O.B.E. who died in August 2007. 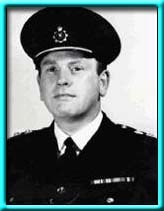 He was initiated into the Lodge when he was a senior Police Officer in the Liverpool City Police and rose to the rank of Assistant Chief Constable but unfortunately his police duties reduced his opportunity to attend the Lodge or take any office. However on his rare appearances he would volunteer to act as a steward and enjoyed the banter when he served the wine to the many Liverpool Police members of much lower rank than he. He retired in 1976 moved away and resigned from the Lodge. Bro. Ronald Smith Lancaster O.B.E. On our last regular meeting for the month of October we had the extreme pleasure of welcoming back a member of a family that is synonymous with Minerva Lodge, that Family is the Prichard Family and if you will take a moment to look at the role of Past Masters on this website you will see that this family name appears twice back in 1940 and 1941, the two brothers were the Lodges Worshipful Masters for that period of time. There was however a third brother who never took the office of Worshipful Master and he was killed during World War II at Tobruk. He was indeed one of Four Brothers who were all members of Minerva Lodge. He was survived by a Son, namely Robert Prichard (Bob) who after his fathers death was put forward by Minerva Lodge to be accepted and sponsored entry to the Royal Masonic School for boys. In 1948 he was admitted to the School at the tender age of 6 years old and was one of only 30 young boys accepted into the school at such an age, the normal age being 7 or 8. Bob was at the Junior school until he was 12 and then he went on to the Senior School until he was 18 years old. After his time at the Royal Masonic School for Boys he worked for I.C.I. as an industrial chemist working on experimental products until he retired. He joined the Old Masonians West Lancashire Lodge in 1963 when he was 22. This Lodge was founded by old boys from the Masonic School in 1960. He became Worshipful Master in 1972. His Craft Rank is Past Provincial Junior Grand Warden. At present he is Worshipful Master of a Cheshire Lodge he has helped to revive from turning in their Warrant and effectively ceasing to exist. Bobs life story is one of Masonic and personal success, his father and Uncles all being Freemasons, he was educated by Masonic means, then when he was 22 he joined a Lodge and continues to make a positive contribution to Freemasonry to the present day. Bobs visit to Minerva Lodge was an exceptional evening for all our Brethren and was indeed very emotional for Bob himself, it has been talked about with great affection from everyone in the Lodge who attended that evening. We hope that Bob will return to visit us again soon and wish him well in all his endeavours. 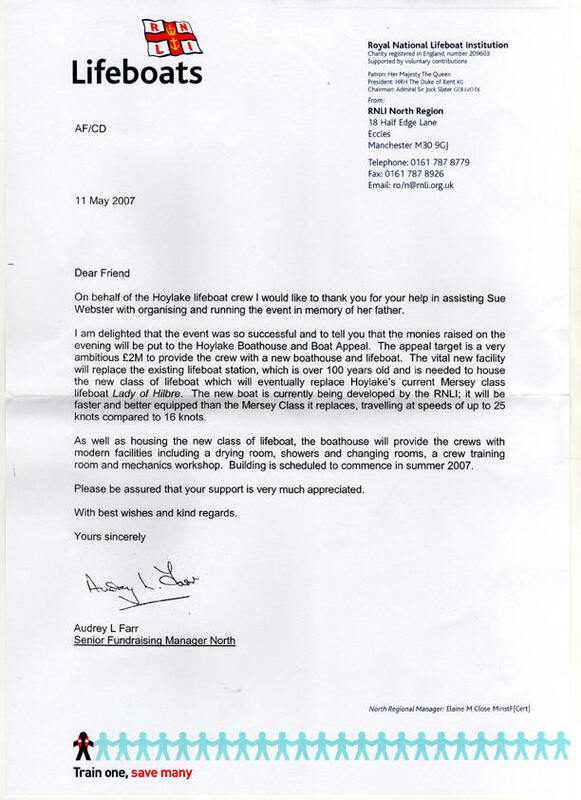 “Having had the honour of preparing the application form; I was privileged to be invited to attend the headquarters of “The Roy Castle Lung Cancer Foundation” on Tuesday the 3rd of July 2007 when Sandon Group Chairman WBro. John Wreyford accompanied by WBro. David Anderton presented a cheque for Â£1000.00 on behalf of “The Community Fund of West Lancashire Freemasons”. This was the amount requested to enable the purchase of a “Spirometer”; a device to measure lung capacity. A further cheque for Â£500.00 was presented on behalf of Mersey Lodge by WM. bro George Hewitt and WBro. Alan Jones. Minerva Lodge supported the charity of choice of one of our brethren who had sadly passed this year, W.Bro John Cawley P.Pr.A.G.D.C. 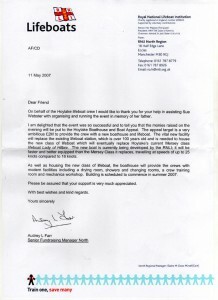 The charity was the Royal National Lifeboat Institute. Several brethren attended the charity evening and helped with the proceedings by running the Tombola, the live auction and by making a donation from the brethren of Minerva Lodge 4002 to the RNLI. The evening was organised by W.Bro John Cawley’s family and was hugely successful raising thousands of pounds for the charity.